With all of the attention given to Aspen's annual Food & Wine Magazine Classic, one might think that wine festivals in our area are restricted to summer. Not so! 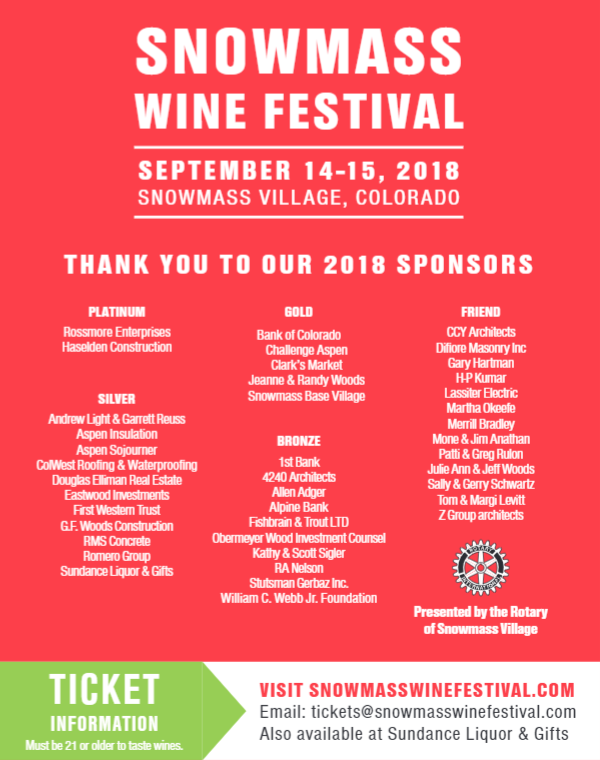 This weekend the Snowmass Wine Festival takes place on Saturday, September 15 from 1:30 to 5pm on the Snowmass Town Park. A grand tasting will offer a wide variety of the world's top wines, plus delicious food from some of our valley's favorite restaurants. Live music by DJ Boogie Down Light & Sound will provide the groove, while you check out the options at the silent auction. All funds raised will be distributed to non-profit organizations in the Roaring Fork Valley, as well as providing Basalt HS senior scholarships and offering support to charitable organizations world-wide.